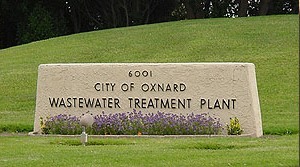 To provide wastewater and stormwater collection and treatment services that meet all regulatory services, in a manner that is cost-effective to the Oxnard customer and protects the environment of the area. Wastewater Source Control Program provides regulatory compliance oversight to other City programs, the City’s industrial and business community, the Naval Base Ventura County, the City of Port Hueneme, a portion of the City of Camarillo, County of Ventura Service Areas 30 (Nyeland Acres) and 34 (El Rio), including the Pretreatment Program, as required by the City’s National Pollutant Discharge Elimination System (NPDES) permit for the Wastewater System. Stormwater Quality Management Program is responsible for compliance with the Countywide National Pollutant Discharge Elimination System (NPDES) Storm Water Permit related to storm water discharges generated by runoff from land and impervious areas, such as paved streets, parking lots, and building rooftops during rainfall events, that often contain pollutants in quantities that could adversely affect water quality. Laboratory Services Program provides laboratory analyses of biological and chemical constituents of wastewater, water, recycled water, stormwater, biosolids and industrial wastewater. Wastewater Collection System Maintenance and Upgrades Program is responsible for the maintenance, repair and upgrade of the City’s wastewater collection system, including more than 400 miles of sewer lines and 15 lift stations, on both a routine and emergency basis. Wastewater Collection Connection provides for the expansion of the system due to the impact of new wastewater customers on the existing wastewater collection system and wastewater treatment plant through increases in wastewater system capacity. Activities funded with connection fees include master-planned capacity improvements to the City’s wastewater system, such as addition of new collection, flow equalization, and treatment facilities. Wastewater Treatment Plant provides wastewater treatment services that emphasize dependable operations, regulatory compliance, reuse of biosolids, recycling of effluent, and stable user rates. Wastewater Treatment Plant Maintenance and Upgrades Program is responsible for preventive and predictive maintenance services on both a routine and emergency basis, for the City’s Wastewater Treatment Plant. Flood Control Program is responsible for maintenance, repair, upgrade, and storm water quality compliance for the City’s storm water collection system, including its catch basins, storm water lift stations, drainage pipes and ditches, on both a routine and emergency basis.